WILLEMSTAD – The Union Central “Union Sindikato Trahadónan di di Kòrsou” (STK) has announced in a written statement that they find it unacceptable that the new majority in Parliament wants to stop all negotiations with the Chinese State Company Guangdong Zhenrong Energy Company (GZE). With this statement, the union responds to the declarations of the Member of Parliament and leader of the new majority Gerrit Schotte of the MFK. Schotte said that the negotiations with the Chinese company should not be regarded as current state of affairs of the outgoing cabinet Koeiman. From conversations between the unions and GZE, it appeared that the Chinese company has all the qualities that STK wants to see in a future strategic partner. 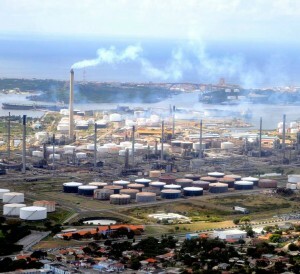 Important projects such as the modernization of the refinery, the Curaçao Refinery and Utility (CRU) and Bullen Bay have been delayed because they are at in the hands of the Venezuelan State Oil Company PdVSA. It is not a secret that PdVSA is in a dire financial situation.